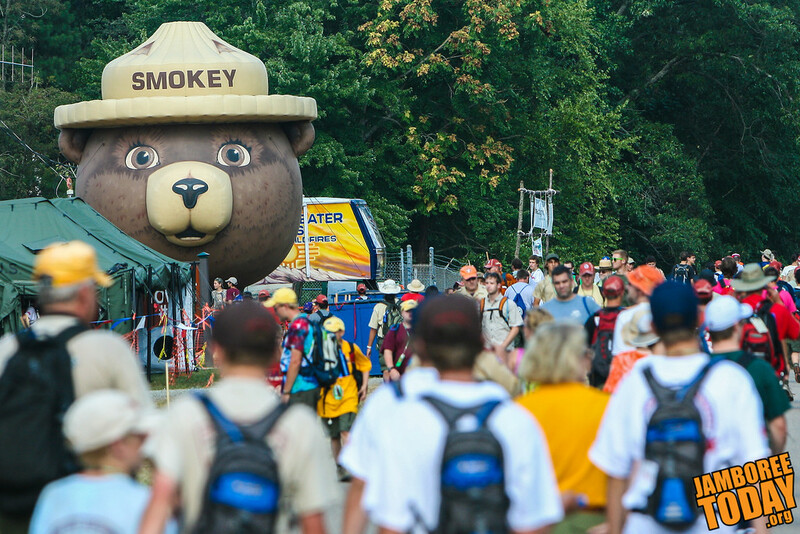 Soon, 45,000 Scouts and Scouters will make their way home from the 2010 National Scout Jamboree. In days, Fort A.P. Hill in Virginia will shrink from a population of tens of thousands to a population of tens of tens. Where there was once a fully functional city with food services, hospitals, a bus system, and a mall (of merit badges) there will be empty fields and a forest of trees. If they do it right, no one will know they were there. The place will be clean as can be, keeping with the penultimate point of the Scout Law. The 2010 National Scout Jamboree was five years in the making, and planners carefully considered each of these points. Of course, with 45,000 campers and up to 25,000 more daily visitors, some of the grass has been worn away. However, the jamboree featured two activity areas teaching these lessons to Scouts. The Conservation Trail engaged Scouts in interactive activities where they learned about natural resources and how they are managed, conserved, and used. In the Leave No Trace and Tread Lightly, they learned how to minimize their harmful impact on their surroundings. Nationwide, Boy Scout camps are moving away from large campfires to cooking on propane or a similar fuel. These cleaner fuels release fewer greenhouse gases into the atmosphere, and leave dead trees to decompose back into their own ecosystems to fertilize the next generation of forest. Individually, Scouts are encouraged to use recyclable materials, refillable water containers, and reusable dishware in place of easy-to-discard disposables. It’s just a cleaner way to operate. We hope that the young men and women who participate in Scouting will carry these lessons of environmental cleanliness and conservation back to their families and communities, so that they may join in. It’s easy to do, too. A year ago, I bought a six pack of Gatorade. When I finished each bottle, I cleaned it and kept it by my sink. Since then, I’ve reused them hundreds of times. Twice a day: In the morning I take juice to work, and in the afternoon I mix up Gatorade from powder. (Glacier Freeze tastes the same premixed or from powder.) The wide mouths on the Gatorade bottles make them easy to fill and clean. In 365 days, I’ve saved 700 bottles by reusing the original six from a year ago instead of buying two single-serving bottles each day. That’s just me, if you do it too, then that’s 1,400 bottles saved—that’s a lot of plastic! As the 45,000 Scouts and Scouters from the jamboree board their busses and planes, they will do so with many fond memories and lessons. They will return to all fifty states and twenty-nine countries, bringing home lessons which may make our world a cleaner, better place for their children and grandchildren.